The VEKA UK Group Supports Local Hospice With More Than £12,000! 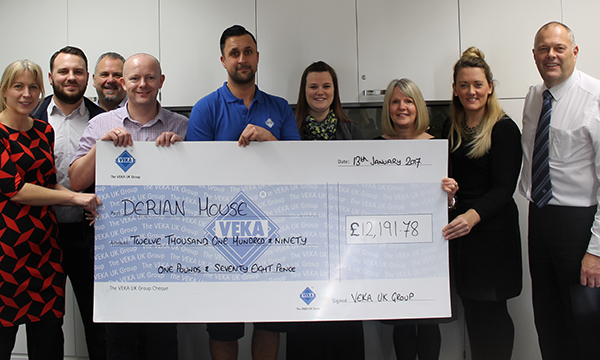 The VEKA UK Group has raised an astounding £12,191.78 over the past year for Lancashire children’s hospice, Derian House. Staff across every department of the company threw themselves into fundraising for this fantastic local cause. Head of Human Resources Gabriela Hammond explains: “We usually choose two charities to support per year, dedicating six months of activities to each. In 2016, we focussed solely on Derian House and I, for one, am amazed at what has been achieved. It was a pleasure to present such a significant contribution to a charity which does invaluable work in Lancashire. “It’s part of our company’s ethic to give back to the community that we’re a part of, whether that is by engaging in youth enterprise initiatives; careers events; sponsorship for sports teams or events, or by supporting local charities such as Derian House. Derian House Community fundraiser Sophie Saunders said: “We’re truly overwhelmed by the generosity of the whole team at VEKA and would like to say a huge thank you from everyone here at Derian House Children’s Hospice. “We know many employees have put their heart and soul into raising funds, from staging cake bakes and dress-down days to challenging themselves on 10k runs and even donning dresses to take part in our Dames on the Run event!